In The dashboard: A guided tour, you learned what the Visualead dashboard is and what you can do in this section of the platform. We will now delve deeper into the sub-sections of your personal dashboard as you go about generating your QR codes. This page mainly has two parts: one where you select the QR code data type and the other is where you indicate content on the fields provided based on the type that you have chosen. There are several data types that Visualead offers and much of these have been discussed in the knowledge base category "QR code data types." The information that you supply are the details that appear once the QR code is scanned. Be sure to enter accurate information when supplying these details. Once your content is ready, you can now design your QR code. You are directed to a page where you are given an option to either choose from the stock images that we have, or upload your own. 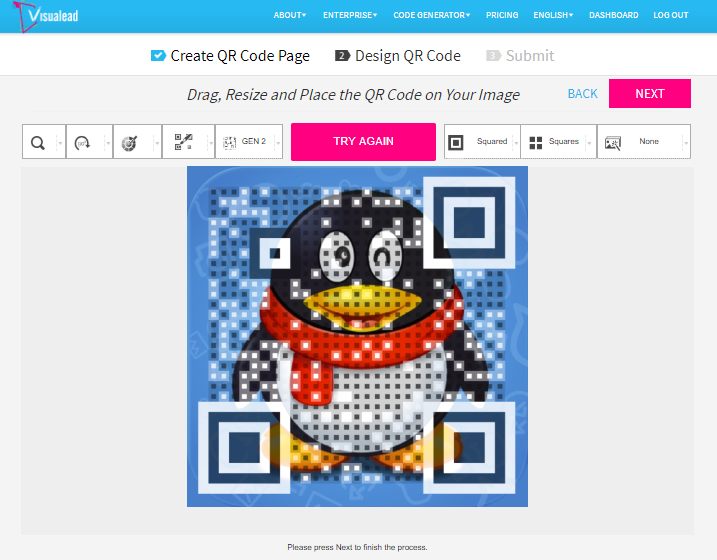 Once done, you can now proceed to designing your QR code. You can modify elements such as the QR code positioning, shape, color and even the style of the image. You will be provided with a live preview of your QR code. After you have finalized everything, your QR code is now ready for downloading. You will be redirected to the main dashboard where all the created QR codes are in place. You can go back to the design page to edit the content of your codes at any time; however, keep in mind that the images may not be changed.